today, i'm guest posting over on elease's blog the little lovebirds and i'm sharing one of my favorite sorbet recipes! in the summer time, nothing beats desserts that incorporate fresh fruit. since raspberries are one of my all time favorite fruits, i wanted to share my recipe for fresh raspberry sorbet. this sorbet is so simple to make, and it only requires a few ingredients. the tang of the raspberries together with the lemon juice is so bright and refreshing in the warm weather months. it will make you feel like you will never want summer to end! be sure to check out my guest post and recipe here! in a saucepan, bring the water and the sugar to a boil, stirring constantly in order to dissolve all of the sugar. reduce the heat to low, and simmer without stirring to make a syrup (about 5 minutes). pour the syrup into a bowl, and add the vanilla extract. place the syrup in the freezer to chill (about 15 minutes). in a blender, puree the raspberries, the syrup, and the lemon juice, until smooth. strain the raspberry puree through a sieve and into a bowl in order to remove the seeds. pour the strained raspberry puree into an ice cream maker, and freeze according to the ice cream maker's instructions (about 30 minutes). remove the sorbet from the ice cream maker and transfer to a freezer-safe container. freeze until completely set (about 1-2 hours). 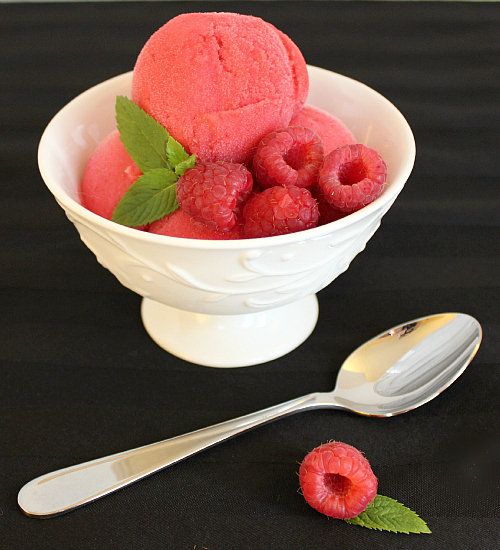 serve the sorbet garnished with fresh raspberries and a sprig of fresh mint. Oh My, doesn't that sorbet look cool and refreshing. The vibrant raspberry color against the black background with the green mint accents, looks like a recipe straight from a magazine. I think Lenox would love to see that picture showcasing their china.